KSP 0.22 has introduced a new "career mode", which introduced a tech tree, which you can progress along by collecting "science". I've figured out some things that can give you science, but I know I'm missing a lot of them. How can I collect science? Science points are earn by doing experiments in diverse situation. A basic launch and land rocket will earn you some points. 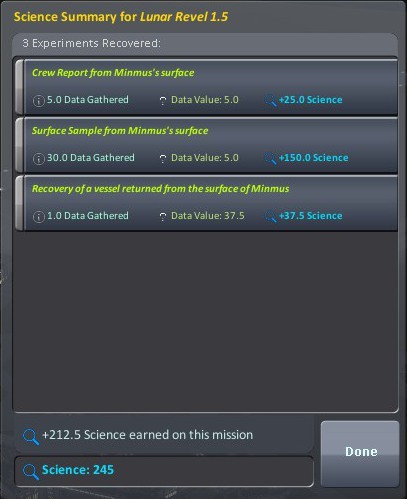 Better flights (orbital, Mun fly-by, etc) will get you additional rewards. As far as science is concerned, the basic rocketry science node give you access to the Mystery Goo Containment Unit. This is your main scientific related module for the moment. Later on, you will unlock in the bottom tree the Sc9001 Science Jr. module. Other parts with science experiments are all the old scienctific sensors and the Sensor Array Computing Nose Cone which replaces the avionics nose-cone from earlier versions. Keep in mind that EVAs and crew reports follow the same principle. EVA on Kerbin will count. You can also communicate information through radio, but it will give smaller rewards (10-40%), but using a probe, it can be repeated multiple times unlike crewed vessel that need to return home. I think I'm missed the EVA report though. M'vy's answer is correct for the most part. You can transmit your scientific data back to KSC. The down side of transmitting data is you lose a percentage of the data and it costs a tremendous amount of electrical power. Also when you perform an EVA you can store the data in your command module and either, transmit it back to KSC or return it to the surface of Kerbin and recover the vehicle(which you can now do from the vehicle when you've stopped moving - hover over the altimeter). You can store more than one EVA report IF it's from a different location. Eg High Kerbin Orbit and Mun Orbit can both be stored. I've had 5 stored experiments at once. Also collecting Surface Samples, eg. Mun rocks, is worth a huge amount of science. And a sample (or EVA report) from Mun's highlands is different from the Mun's lowlands. There are at least 3 different Munar locations to sample. Each time you return the same scientific data to KSC (transmitted or recovered) it is worth less science. So the first crew report from orbit is worth 100%, the second 80%, etc. But if you can land on Mun or Minmus keep conducting experiments and transmitting the data back for massive science. I've got over 3000 science from a single launch. For more info and the hard numbers, check out the KSP wiki on science. For less numbers and more examples, check out Scott Manley's excellent videos on science and 4 planet + 2 moon super science mission. What Science can I perform on and near Kerbin? How can I see all tech tree nodes? Space plane take-off & landing using only basic parts? What are the altitudes for the various altitude record contracts? Is there a way to play KSP without having studied rocket science? Can you only get the same science once? Why is this mission not complete?